On April 2008 the agreement for the transfer of management and facilities of the Centre Municipal d’Esports Nàutics of Roses for GEN between the municipal Port of Roses and GEN Group d’Esports Nàutics of Roses was signed at the Town Hall conference hall in Roses. 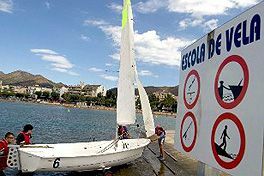 The agreement was due to the willingness of the three institutions to join efforts in promoting nautical sports activities related to the sea, transferring the management of the centre to GEN Group d’Esports Nàutics of Roses , an organization with extensive experience since 1980 in the field of education of various kinds of sailing and nautical sports. With the approval of this agreement, the Council has sought to have an impact on several objectives. On the one hand, it seeks to encourage the development and improvement of sport in town, particularly working in the integral formation of children and youth in the municipality. Another strong line of action is to promote the town in terms of tourism, thanks to the potential offered by the new marina, which makes it a remarkable nautical centre. 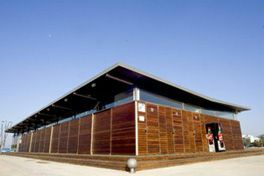 Based on the signed agreements, GEN has managed the municipal centre of nautical sports for three years, renewable for biannual periods, and has been transferred its assets such as the headquarters building, the launch ramp and adjacent dry beach, and parts of the breakwaters next to Cuana stream. In return, GEN is committed to developing its activities according to the agreed working lines by the three entities. Thus, in collaboration with the Council of Roses, it will perform activities aimed at promoting the participation of the villagers such as sports summer camps, hiking or swimming races and social and popular events. 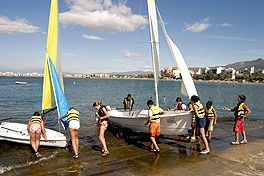 On the other hand, the activity of the municipal nautical sports centre is specifically directed at the municipal schools, with a range of nautical and water sports initiation programmes, promotion and practice, within school timetable. Finally, GEN works together with the Council of Roses and Port of Roses SA in co-organizing nautical events and tourist promotion. The management and activities programme is financed with the fees approved for the use of services and facilities, with contributions from the Council or the Port of Roses SA and with the income , grants and subsidies obtained from the government and private initiative to organize different events. The creation of a monitoring commission, comprising members of the three entities responsible for the proper implementation of the agreement and the approval of the management and activities annual agreement have also been established.